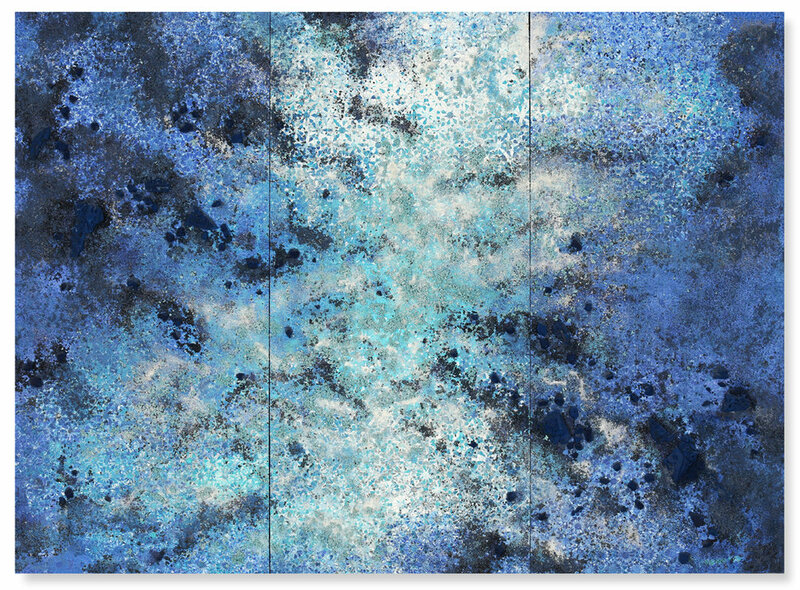 Blue Rectangle #1, 2016 - Acrylic paint, pigments, styrofoam, salt and gravel on wood - 176 x 230 cm - 69.3 x 90.6 in. Immersed in a bicultural environment with a Moroccan father and a French mother, Yasmina Alaoui immediately asserted her refusal of all stereotypes, whether related to women in general or to cultural archetypes from the Arab-Muslim world. Recently, the artist has started to explore new artistic horizons, producing large-framed works. Such abstract compositions evoke vast mineralogical landscapes seen from the sky. Texturologies, burnt or smashed materials by Tàpies and Millares, American bird’s eye views paintings, “futuro-archaeological” installations by artist Chen Zhen or the bright colour range of some of Zao Wou-Ki’s compositions... One can think of numerous and rich associations when meditating in front of these captivating works, where the gaze probes the raw material, ceaselessly loosing and finding its way. Each composition is the result of long hours of delicate elaboration. The artist begins by painting Zellige-type geometrical patterns. Found in traditional craftsmanship and mosaic works, these usually static forms seem to disintegrate here, sometimes even blowing up into pieces and vanishing into space. Once this meticulously skilled stage completed, an eminently physical work begins, in which the artist’s entire body is involved and where the unpredictable plays a crucial part. Yasmina Alaoui covers her geometrical compositions with a mix of materials both organic and mineral: a combination of salt, sand, gravel and acrylic painting is rst applied and then dusted with pure pigments (Tuareg blue, turquoise, pink, green, gold...). Kohl, ashes and hand-crafted stars made of plaster are added, alongside materials collected in the palm grove not far from the Marrakech riad where she works a part of the year: pieces of styrofoam, broken ceramics... Sometimes panels are laid flat on the oor, sometimes slightly inclined while Yasmina gently drops the materials directly on the surface. These drops, like a sedimentary layer, cover some of the work, partly veiling the first outlined patterns that emerged. Ruins of an ancient village, a civilisation that has disappeared, images of destruction or of looming human catastrophe, or perhaps the vision of a vegetal world or cellular division... her works contain something of the cosmic. Some will see a devastated battleground, while others, an image of birth or regeneration. Indeed, many feelings can be triggered when contemplating these works. But beyond any specifc aspect of reality, what prevails is the extreme sensitivity of the artist’s gaze and hands. Two layers are superimposed, one fragile and delicate, the other stronger, almost violent. A portrait of the artist and the world she lives in.